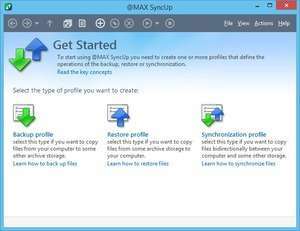 @MAX SyncUp is a file backup and synchronization tool which can backup, restore and sync files between a number of devices like internal and external hard drives, NAS devices, Google Drive and FTP, among other options. Before jumping in and starting a task, you should create a profile. You can have it connect to a local server or a remote server such as an FTP site. You can have the profile perform data backup, synchronization or even file recovery. Version 6.1.600 is a freeware program which does not have restrictions and it's free so it doesn't cost anything. For security reasons, you should also check out the @MAX SyncUp download at LO4D.com which includes virus and malware tests. Additional screenshots of this application download may be available, too.